SSC Stenographer Exam is organized by SSC or Staff Selection Commission to select candidates for the post of Stenographer Grade C and D. SSC Stenographer 2018 Recruitment process has started with the release of its Official Notification. 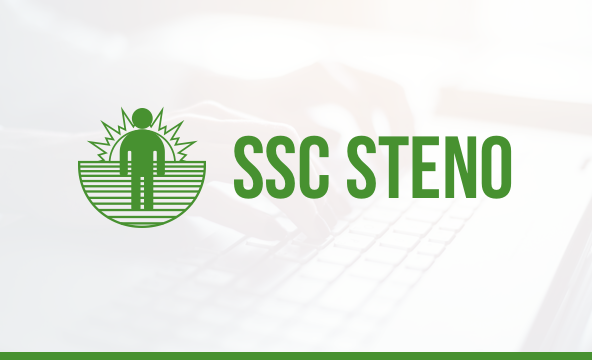 Staff Selection Commission of India (SSC) has released SSC Stenographer 2018 Official Notification on 22nd october 2018. All students can apply online for SSC Stenographer 2018-19 exam. SSC has released New Exam Dates for SSC Stenographer 2018 Exam. The Computer Based Examination for SSC Stenographer 2018 Grade C and D was condcuted from 05-02-2019 to 08-02-2019. SSC Stenographer Result has been announced for the CBT Exam that was condcuted from 5th February to 8th February 2019. Candidates can check the SSC Stenographer Result & Cut-Off by clicking on the link mentioned below. SSC will be releasing SSC Stenographer Vacancy 2018 soon. If we look into the last years' vacancy for SSC Stenographer Exam, we see that for Stenographer Grade D, the total number of vacancy announced is 1276. For Stenographer Grade C the total number of vacancy announced is 429. The Vacancy is expected to be same as of this year as well. The Application Fee for SSC Stenographer 2018 is Rs. 100/-(for General and OBC). Candidates belonging to SC/ST/PWD/Ex-servicemen category as well as female candidates are exempted from paying the application fee for SSC Stenographer 2018. The SSC Stenographer 2018 examination will be conducted in 2 different levels. The first level is Grade C and D exam that comprises of MCQs and is conducted online. After this exam has been conducted, an exam to test your skill sets in various domains is conducted by SSC. Candidates who obtain the qualifying marks in the Examination as may be prescribed by the Commission will be called for the Skill Test. Commission may also prescribe qualifying marks in each part of the Examination. The Skill Test will be of qualifying nature and the Commission will fix the qualifying standards in the Skill Test for different categories of candidates. Candidates who opt to take the Stenography Test in Hindi will be required to learn English Stenography and vice versa after their appointment, failing which their probation may not be cleared by appointing departments. Candidates have to work as English/ Hindi stenographers as per the functional requirement of the User Office irrespective of the medium of Skill Test of candidate during the examination. Detailed instructions regarding Skill Test will be sent by the concerned Regional/ Sub Regional Offices of the Commission to the candidates called for the Skill Test. The revised syllabus for SSC Stenographer 2018 was released by SSC in its notification. The syllabus for SSC Stenographer is different for both the stages of examination and it is mandatory for students to know the entire syllabus in order to prepare effectively for SSC Stenographer 2018. General Awareness, General Intelligence/Reasoning and English Language are the three major sections a candidate need to proficient in for Paper-1 of SSC Stenographer 2018 Exam. The minimum Educational Qualification required by a candidate is to be at least 12th pass from a recognized Board or University. He/She must be able to produce the required documents when asked for verification after qualifying SSC Stenographer 2018 Exam. A candidate must lie in the age domain of 18-30 years to be eligible for SSC Stenographer 2018 Grade C Exam. A candidate must lie in the age domain of 18-27 years to be eligible for SSC Stenographer 2018 Grade D Exam. The Cut-Off for SSC Stenographer 2018-19 will be declared once the result for the same has been announced by Staff Selection Commission of India. To get an insight into the upcoming SSC Stenographer Cut-Off 2018-19, let's have a look at the previous year cut-off for the exam. It is really important to prepare effectively for SSC Stenographer 2018 Exam if you want to scale this paper with flying colours. Prepare from Offline Classroom Program or chose from our Correspondence Course or E-Books. Give as many Mock Test Series as you can to score high in this paper. Believe in yourself and learn the major two mantras to crack the exam: Speed and Accuracy. Solve Past Year Question Papers to know the pattern and level of difficulty of questions being asked in SSC Stenographer Exam. Keeping in mind the SSC Stenographer 2019, we are launching various Test Series, Classroom Programs and Seminars to guide you through your preparations. The Cut-Off for SSC Stenographer 2018 will be declared once the result for the same has been announced by Staff Selection Commission of India. To get an insight into the upcoming SSC Stenographer Cut-Off 2018-19, let's have a look at the previous year cut-off for the exam.